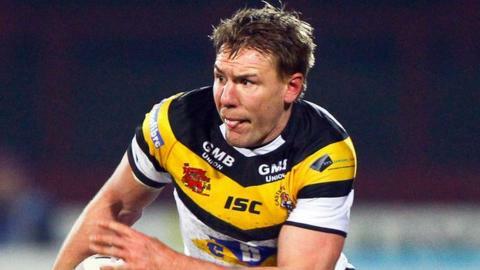 Castleford Tigers condemned a shell-shocked Warrington to a crushing defeat and moved second in the table. The Tigers, who have been the surprise package this season, brushed past last season's Grand Final runners-up for their eighth win of the season. Michael Shenton grabbed a hat-trick of tries, Jonathan Clare picked up two while Jamie Ellis and Richard Owen also added their names to the scoresheet. Warrington's only score came through Michael Monaghan's converted try. Castleford only managed nine wins in total in Super League last season. The Tigers who fielded a much-changed side, with winger Justin Carney and second-rower Oliver Holmes missing out, managed their first home win over the Wolves since August 2008. Warrington have now lost five of their opening 10 matches and sit eighth in the table, six points off second placed Castleford. "I thought we'd be good. When you put a team together and you've got quite a few new players in there then you don't know how good. "But the way the players have gone about it, it is a rightful position. It's not by any fluke or luck, the players are putting genuine performances in. Whether I thought we'd be second I'm not sure about that, but I thought we'd be competing on a weekly basis. "I thought we played some really smart stuff. Early on, Warrington just punched their noses through us a little bit and they had a little bit of ascendancy in terms of field position, but once we got a foothold in the game we were really good." "They were a lot sharper, particularly in the second half. I've just asked some of my staff to see if they could unpack our attacking game, I think it was left on the coach. "It wasn't a great day for us and Cas played well. The first half, there wasn't much between the two teams. The scoreline suggested that as well and they probably deserved to be slightly ahead at half-time, but they found some momentum in the second half. "Whichever team was going to pop up with some of those big plays was going to get control of the game." Castleford: Tansey, Owen, Gibson, Shenton, Clare, Sneyd, Ellis, Lynch, Milner, Wheeldon, Mariano, Webster, Massey. Replacements: Huby, Millington, Hauraki, Clark. Warrington: Russell, J. Monaghan, R. Evans, Atkins, Penny, O'Brien, Ratchford, Hill, M. Monaghan, Asotasi, Waterhouse, Laithwaite, Harrison. Replacements: Higham, Currie, England, B. Evans..